Take down anything that looks like Summer that you can do without. I pack away my blue pillows, milk glass, etc. Mix it up. Try at least one new thing each year. I love my new mercury-glass pumpkins. Retire anything that has gotten too musty or dusty, like wreaths that have seen better days or straggly old garland. UPDATE: The Fall Open House has begun! Top photo via Pottery Barn. If You Missed It: Please Take That Fall Wreath Down. Fall Decorating Party: Link Up! It’s the First Day of Fall: Is Your House Ready for It? I’m Decorating for Fall–Are You? .-= Becky @ Farmgirl Paints´s last blog ..Jimmy Johns =-. Looks great! I love that orange pitcher and those mercury glass pumpkins are gorgeous! Where did you find them? .-= Jessica´s last blog ..Age =-. Love the fun and simple tips! Fun idea for a fall decorating photo share! .-= Adventures in Dressmaking´s last blog ..Pics from the last civil war re-enactment =-. .-= Pamela Rosenberg´s last blog ..Motivated Monday 3 =-. .-= Marie’s Maison´s last blog ..Tea with Marie Antoinette =-. What a beautiful home-and your pics look like you like to decorate simply, which I also like very much! That pretty little girl resembles you! And btw, I like the new photo of you! .-= Josanne´s last blog ..Stay Tuned!!! =-. You have such a beautiful home! Love your tips. When you mentioned pine cones I instantly thought of the cinnamon-scented pine cones you can buy at the grocery store – to me, those completely signify the beginning of fall! And I love love LOVE that black and white toile chair! .-= Kate (Little Beach Bum)´s last blog ..Coconut Sweet Potato Curry =-. Love, Love, Love the mercury glass pumpkins!! You have to have a mantel before you can decorate one, and I don’t. I have asked my handyman to make me one, since I don’t like the mantel kits I see and I have a bowed, convex (bends inward) brick fireplace, and attaching a mantel will be harder. Oh, I want one so bad. Hi Julia I only have one word to say b-e-a-utiful…… I love Autumn for its colour and the cool but pleasant air and I love your traditions from this time of the year on to Christmas. When I look at your post and your top 10 I don’t miss out thank you for that…… Regards Esther from Sydney…. PS from what I see you have a warm home to come to…..
Great tips. You have the best fall decorations. I wish I could participate in your party, but I don’t have any decorations to share. It was an all-time-record-breaking 113 degrees in Los Angeles today! I can’t think about fall yet, but I love your ideas Julia. .-= Laura´s last blog ..A weekend of baking- shopping and wine =-. Our cool weather finally hit, today! I can actually think about autumn, now! .-= Trish @TheOldPostRoad´s last blog ..In My Next House =-. Oh I just made my fall wreath last night! Guess I have a new post to write tonight! .-= Samantha´s last blog ..Kitchen Makeover Part 2- Cabinets =-. I am so obsessed with your turquoise sideboard!! I swoon every time I see a photo of it. And the pumpkins look great on top! I need to decorate our house for fall still, every time I set my mind on doing it we have another 80 degree day and then I can’t get in the proper mood. .-= hip hip gin gin´s last blog ..A Tartan Tale =-. finally. I figured out what I was missing. an adorable girl in an orange shirt. .-= The Nester´s last blog ..The Home of a Home Stylist =-. Oh, goody, Julia! You just gave me the kick in the pants I needed to get some things done around here! I loved your party last year, so I’m off to get ready for this year’s. Before I go, though, I’ll say that your house looks WONDERFUL. And so clean and uncluttered! I love that. When did you post the new photo of you? I just noticed it today. It’s really good! 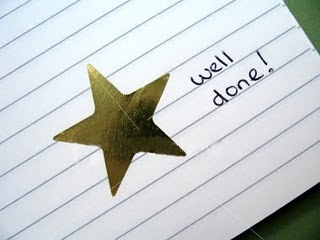 .-= Richella at Imparting Grace´s last blog ..The sweetest gift =-. I’ll try to remember to link up, I’m knee deep in writing my 31 Days of Autumn Bliss so I’m all about Fall right now! But I hadn’t thought about the girl in the orange shirt. Good thinking! .-= melissa @ the inspired room´s last blog ..4 Simple Steps to Creating the Home You Want Timeless Advice =-. I stored away all the shells and driftwood last week as well. I love fall decor! Luckily I found small pumpkins on sale at Hobby Lobby for 50% off. I got a ton of different sizes and colors. The funny thing is I have a baby shower I am hosting in a few weeks so some of them are going to be painted hot pink b/c the shower theme is “lil pumpkin” and she is having a girl. But, it is nice looking at all the colors of fall in the house for a while. Your home looks so lovely! And that pic of your daughter (with accompanying comment) is too cute. I guess I’m just in major denial that it’s already fall. Have a fun blog party – I can’t wait to see everyone’s decor! .-= Kelly, Arte Styling´s last blog ..Adventures in Half Moon Bay =-. .-= Juju at Tales of Whimsy & Vintage Whim Wham!´s last blog ..Free Reads- Christian Fiction Sunday =-. .-= Tanja @ Postmodern Hostess´s last blog ..the faux taxidermy trend may have jumped the shark =-. .-= cailen´s last blog ..squash- acorn squash =-. I remember shopping with you when you bought that mirror! It’s held up well! .-= Slowish Food´s last blog ..Taking Stock =-. I just made a my first pot of soup for Autumn, does that count? It’s kind of decorative..LOL! I’ve been obsessed with those dang mercury glass pumpkins of yours since I first saw them. I went to Homegoods yesterday to buy them BUT….they didn’t have any. I’m going to TX Maxx tomorrow since they are the parent company of Homegoods…hope they have them. If they don’t have any, send your pretty little daughter. She beats any pumpkins by a mile!! .-= Pat´s last blog ..Convenience Soup =-. Thanks for the tips! Considering it’s 97 degrees here right now (ugh), I’ve been looking for some motivation to get the fall stuff out…I think you just provided it! .-= Cheri@IHeartOldHouses´s last blog ..Where’s the Wastebasket =-. I always tease my red-headed friends that it’s not fair- as soon as the weather changes they fit right in! No need to decorate! Lucky you, Julia! PS- I love the mantle decor. Simple and sweet. .-= Rhiannon´s last blog ..Rainy Day Blues =-. I found you from the Nester’s blog….I love those mercury glass pumpkins!!! Sweet! I will see you tomorrow at the parties…..so excited ! .-= Sarah @ Thriftydecorchick´s last blog ..A fall mantel =-. Love the pantry pics! fab kitchen I’d be decorating that corner everyday-not just Fall!! I have not seen anything like it up here in Canada. It really amazing, very mod-nuclear! My guess is that it may be a sleek – kind – of – toaster oven? Is it also a fall attribute in your home? I love your house! It’s so clean and stylish. Also what I love to do in the fall is put mums and corn stalks on my front steps. Some people might think corn stalks are tacky but I love the harvest-ie look about them! .-= Sue´s last blog ..Sunflowers in a Bulb Tray =-. I love your mercury glass pumpkins too! Where did you find them? .-= Kristin´s last blog ..Shoes and Courtesy =-. Fabulous tips, every corner looks amazing and with so much space. Love it! Your house is gorgeous! I love all your fall touches and I am still seriously in love with (and seriously jealous of) your turquoise table! I know it was a gift and that makes it even more special. I love fall (hands down favorite. Halloween trumps Christmas in my book) and your tips are perfect. I’ve already decorated my bedroom for Halloween (think glitter skulls and a feathered crow) and I can’t wait to do the front porch! Great post! .-= Bre´s last blog ..Beauty Transgressions =-. Oh, Julia…I’m sooo sorry I missed this! I even redid my door for fall right around the time of your party. I love your fall decor. 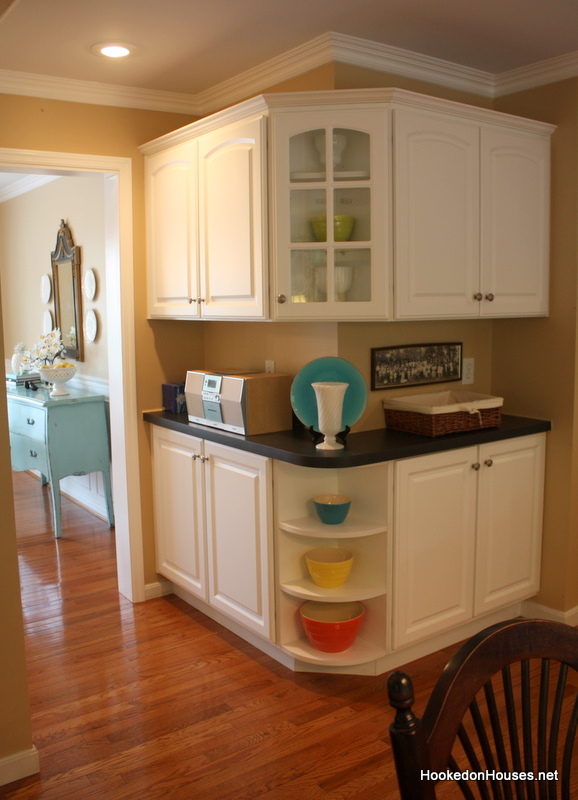 The corner cabinets you have are so wonderful for decorating. I love how that space is designed to take advantage of the whole corner…and fun to display your fall pretties! .-= Susan´s last blog ..Welcome to the 110th Tablescape Thursday! Sketch Floral Makes Its Debut =-. .-= Gloria´s last blog ..Happy Birthday to Gary =-.